What started as an Instagram page to update friends on all-things-NBA has turned into a full-on basketball blog. 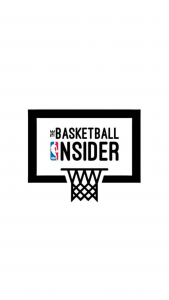 Senior Danny Katan created @thebasketballinsider in July 2017, and since then has gained 5,488 followers. Katan was inspired to create his account when his friends kept asking him about which players got signed, which players were injured and other NBA news. Katan originally created a Twitter account, where it did not get a lot of attention. He did some research and discovered that Instagram is the better platform for this type of page. After devoting himself to basketball blogging for over five months, Katan, a psychology major on the pre-med track with a sports administration minor, is now considering a different career path. “After doing this page it really made me see that I love basketball and I love sports in general and maybe that’s the way I should go,” Katan said. After graduating in May, he is going to see if he can get a job in the sports world before going back to the medicine route. Katan noted how hard it is to tell which posts will do well, saying the ones that he thought would get a lot of likes, didn’t. He recalls the post that got the most attention: when the NBA was switching from Adidas jerseys to Nike. With over 5,000 followers to keep up with, Katan admitted that his blog is very time consuming and he is constantly on it either posting or talking to other sports bloggers. He has to know when to stop checking the likes and comments that come in every second. Katan holds a dual-citizenship between the U.S. and Canada. At the age of 10, he moved from Forest Hills, N.Y. to Toronto. His ultimate goal is to work for the Toronto Raptors. 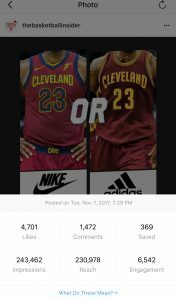 Katan received the most likes and comments on a post that asked his followers if they preferred the Nike or Adidas NBA jerseys.